Also joining our top-of-the-line hardware are the new MAGNUS Gaming Mini PC and VR GO backpack PC. MAGUNS pairs up with the 8th generation Intel processor for the first time to bring a six-core processor to the Mini PC form factor. The VR GO backpack PC gets upgraded with a GeForce GTX 1080 graphics card, delivering unprecedented graphics performance and a truly mobile VR experience. 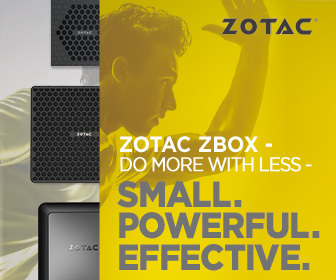 “Our users can easily take their Mini PC, Notebook, or Desktop to the next level by plugging them into these extremely portable and compact solutions, not to mention AMP BOX MINI is the smallest Thunderbolt 3 expansion dock available today,” says Thomas Chow, Product Management of ZOTAC Technology.